The Daly River was in good condition for the event at the end of May, but carrying only average fish stocks after an average wet season. The bumper year of 2010/11, when Daly catch records fell, was still on everyone’s minds. Fishing was fairly slow, but some big barramundi were caught by Classic competitiors. Just like the NT Barra Nationals earlier in the month, most of the big fish were caught on the bigger tides. During the neapest tides fishing was very slow. Catch stats were interesting: there were 116 fish from 40-49cm, 224 from 50-59cm, 92 from 60-69cm, 11 from 70-79cm, five from 80-89cm, three from 90-99cm, and 14 at a metre or more. This data and that from the Barra Nationals earlier in the month suggest the 80cm to 100cm class seems to be almost missing from the river. It is not unusual for year classes to vary in numbers, presumably because of seasonal events that affect young fish survival, and perhaps older fish mortality in billabongs some years. Most Meritorious Fish: Josh Ker 120cm barra (pictured below). There were 462 fish caught and tagged over the week of the competition. It’s all about the tides. That was the lesson from the Club Marine Barra Nationals 2014 on the Daly River. During the pre-fish and the first two days of the event when the tides were at their biggest, the metre-plus barra were hunting mullet and those trolling the middle of the river were catching them. Kane Dysart, who landed a stunning 118cm fish during the Nationals, said he caught three metre-long barra during the event’s pre-fish. Champion fisho Shane Compain had predicted that the Nationals would be won in the first two days, and he was right. As the tides diminished to neaps later in the event, the barra caught were smaller and the bite was primarily in the morning. It will be interesting to see if organisers run the event on bigger tides in future. The upcoming Barra Classic on the Daly will be held on building tides, so the big fish will likely show towards the end of the event. Those fishing outside the Barra Nationals official hours found smaller barra were ravenous at night, an indication yet again that having many boats on the water during the day does put the fish down to some extent. The question is, does the big tide rule extended to all big NT rivers? Some Top End rivers are quite different in habitat from the Daly. The comp showed that there’s a good stock of fish in the Daly River this year, albeit not as many fish as the big flood years experienced in the Top End recently. Fishos remember those years fondly, but they are not the norm. When the wet season rain starts in late November and doesn’t stop until April, the river barramundi fishing goes ballistic, often lasting all year, but more often than not the rainfall is not quite so co-operative and the fishing quality is average. Average in the NT of course generally means very good fishing, and there’s always the bluewater fishing to fall back on – barra tend to distract from the NT’s excellent coastal sportfishing opportunities. Barra Nationals 2014 results can be seen on this thread on the FFF fishing forums. It has been a reasonably good run-off this year on most Top End rivers. 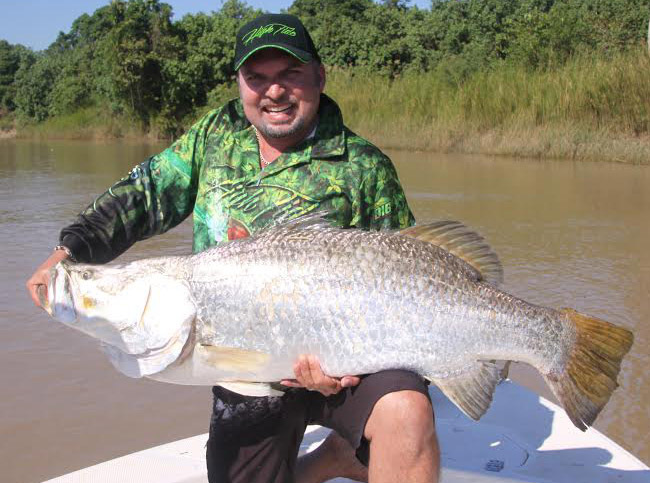 Although by no means close to some of the record rain years in the recent past, there was enough rain to keep the rivers up for long enough, and as I write this the popular greenwater season of trolling for barramundi is well under way. One river was exceptional – the mighty Victoria River, which had extended rain, and turned on the best barra fishing it had for a long time. The famous NT Barra Nationals event kicks off this week on the Daly River. The previous set of big tides saw the Daly produce barra up to a stunning 133cm, including a 126cm stonker from the bank. What will happen next week with the Barra Nats boats on the water? It is impossible to say, but I suspect the big fish might come on again. The Daly fished well this year, although delayed access to the public ramp slowed everyone right down. While the Top End wet season was not as good as hoped, it was enough to get barra into most rivers and the fish are now there to be caught. The Top End’s Shady Camp produced some great barra in March and April, and monster threadfin salmon are now a regular part of the catch along the coast out of Shady Camp since the gill nets were removed. The Barra Nationals results will be posted as they come in at www.fishingterritory.com.